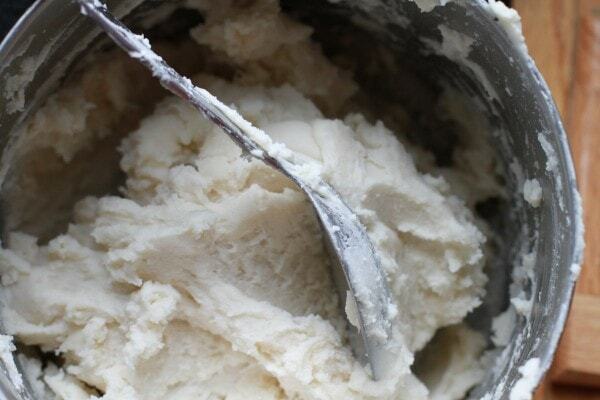 Homemade play-dough is a staple in many homes, I know. So, it may shock you to learn that I have never made it for my kids. In fact, for many years, we didn’t even have any play-dough in our house because I figured the mess would probably make me crazy. But Sonia and Zoe got some cans of Play-Doh as a gift a year or two ago, and since they’re not preschoolers anymore, the mess hasn’t been that bad. So, for our monthly craft, we decided to make our own play-dough. 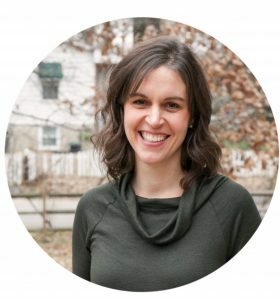 I’m so glad I committed to doing this and blogging about it, because I know for certain I would not have gotten around to this yesterday otherwise! The ingredients for play-dough are very basic…vegetable oil, cream of tartar, salt, flour, and water. Someone had given me some flour they didn’t want, and since it was out of date by a few years, I didn’t want to use it for baking. But this is a perfect use…no one is eating this, hopefully, so off-tasting flour is no problem. To make your dough, first combine all the dry ingredients in a saucepan off the heat, then add the liquid ingredients and stir. Sonia and Zoe had a great time dumping and mixing. And not very much flour got onto my stove. Turn the stove burner on low heat, and cook and stir the dough until it becomes thick and cohesive. It should look like the most awful, gluey mashed potatoes you ever did see. The recipe I followed said this would take two minutes, but ours took a lot longer than that…maybe more like 10 minutes. Perhaps the other blogger has a gas stove, which would mean her burner would get warm faster than mine. At any rate, once it’s all gluey and hard to stir, let the dough cool a bit and then dump it out onto your counter. 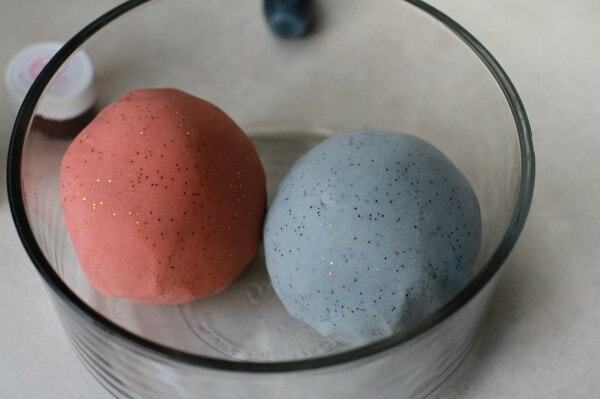 Knead it to make a smooth dough, and then you can add color and glitter if you so desire. We made a well in the center of our dough, added food coloring, and then kneaded the dough until the color was thoroughly incorporated. If you have countertops that you adore, you’ll probably want to do this on a mat of some sort. My counters have seen better days, and while that means they’re kind of ugly, one upside is that I don’t have to be super careful with them! In my blog research for this project, I came across the idea of adding glitter to the dough, which I think is brilliant. It’s probably the least messy use for glitter I’ve ever seen, actually. 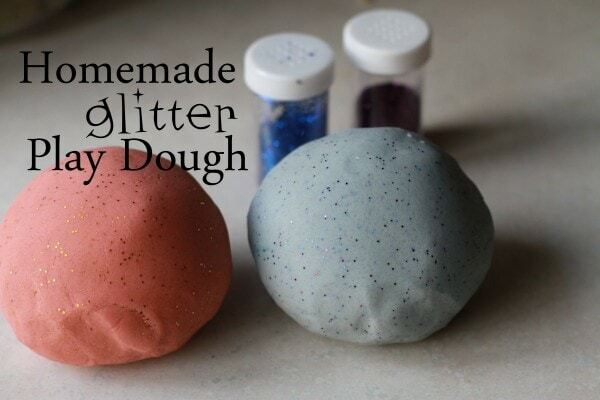 To make the dough glittery, just knead glitter in using the same method you used for the food coloring. Easy peasy. 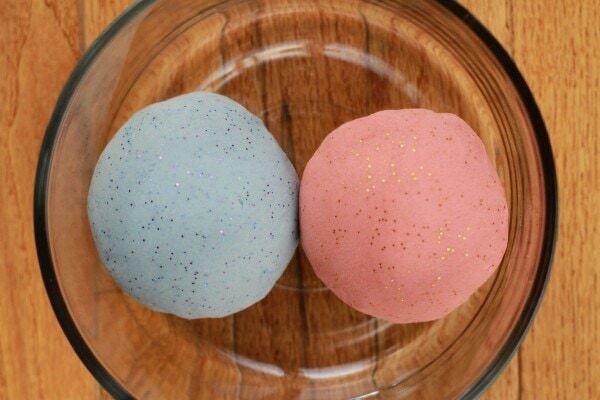 For her dough ball, Sonia chose pink with gold glitter, and Zoe picked blue with blue and purple glitter. They’re very pleased with their new play-dough, partly because they made and designed it themselves, and partly because of the sheer volume the recipe produced. Only about half the dough is pictured below, and those two balls alone are probably the equivalent of 4-6 commercial Play-Doh cans. Four Play-Doh cans seem to run about $6, and I am positive that our homemade dough cost way less than that and produced about twice as much as four cans would hold. The water is a penny, maybe, the cream of tartar costs about $0.50, the cup of salt costs about $0.10, and my flour was totally free (even if I did buy flour, 2 cups wouldn’t cost much). The food coloring and glitter are a little difficult to calculate, but the small amount we needed wouldn’t add up to much. Anyway, making and using the dough was a lot of fun for my girls, and it’s quite a frugal project. I’m excited to try some of the fun variations out there, like gingerbread play-dough and peppermint play-dough. In a medium saucepan, off the heat, combine the salt, flour, and cream of tartar. 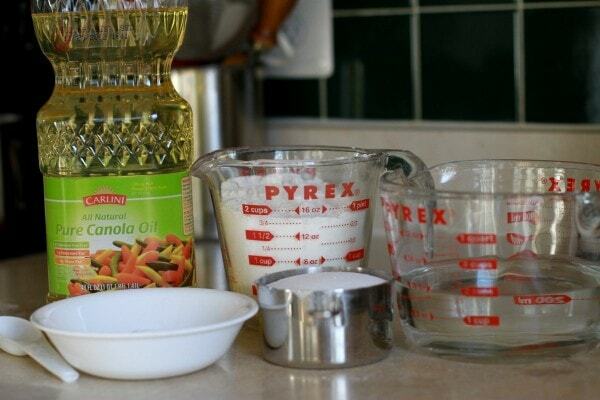 Stir in water and vegetable oil. 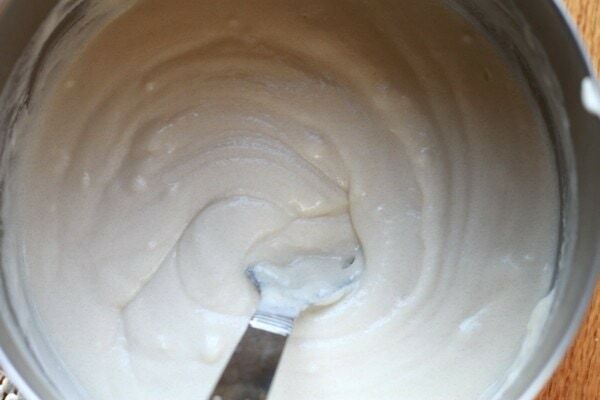 Heat and stir over low heat until the mixture becomes a cohesive mass, like gluey mashed potatoes. Let cool for a few minutes, then turn out onto a counter and knead until smooth. Knead in food coloring and glitter as desired. Store in an airtight container or plastic bag. Today’s 365 post: This might be the most random collection yet. We use this recipe as well and it makes great play-doh. In the winter, it will be fine on the counter, but in the summer we keep it in the fridge. It can spoil in the heat and when it spoils, it smells horrible! Another variation is to add a packet of unsweetened kool-aid rather than food coloring…it adds color and a yummy scent! I second the Kool-Aid idea! We had to make some for our son’s preschool class (they only use home made dough). I’m in love with it! I third the Kool-aid idea, we have been making it that way for years. It smells almost good enough to eat…so maybe not for real little ones. “Knead it to make a smooth dough” – now we know why you chose this particular project! How long does this dough last before getting unusable? William if you keep it in a sealed container it will last several weeks, and you can always add a little oil and re-knead if it gets dry. Having not made it for my kids before (the last time I made it was in high school for a church childcare program), I can’t say for sure. I’ll keep you posted, but I think like Jessie said, as long as it stays in an air-tight container, it should last pretty well. The copious amount of salt should help preserve it, right? The first time we made it, the dough molded within 2 days. However, I did put it in the air-tight container when it was still a bit warm, so there was condensation. I’d suggest sticking it in the fridge too to keep the mold away. i have made this many times for my kids, its great. Just a quick note , I add the food coloring to the water that is added and this is much easier than kneading the food coloring into the dough. That’s a great idea if you’re just making one color! I’ll keep that in mind if Sonia and Zoe can agree on a color next time. They each wanted to pick their own shade this time, though. I never really thought about adding glitter – that would be interesting. I’ve also found that if you mix food coloring and natural colorings you can get stronger colors. Try turmeric, paprika, and if you want a really bright green, head over to the health store and get some spirulina! Ooh, I do have a container of pretty old paprika. I’ll dig it out next time. There are tons of different recipes online for playdough. We use less salt and a bit more oil, truth be I really never measure anymore. We use packets of unsweetened KoolAid for scent and colors, works great. We also keep ours at room temp and the stuff we are currently using is at least 6 wks old, no slime or funky smells. I will probably make more in the next month or so when I get around to it. We add the coloring at the liquid stage. 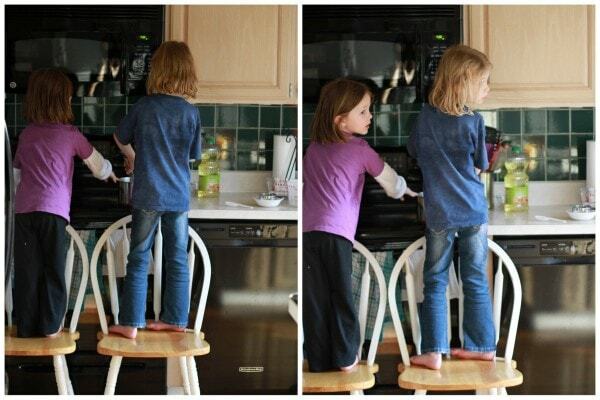 But this is a great way to get them practicing those kneading skills. Love the glitter idea since glitter is SO messy we don’t use it a lot. And yes it really only takes a couple of minutes on a gas stove. Ah, I figured that must be why mine took so much longer. Electric stoves take a while to get hot. I really wanted to try that kind, but Sonia and Zoe didn’t want brown dough. Oh well. When I was a kid my mom would make us edible peanut butter play dough. We would play with it for a few hours then snack on it. The glitter play-doh you made is so pretty! I loved play-doh when I was a kid. Kind of wish the kids (they’re just babies) I know were old enough to play with play-doh so I have an excuse to make–or play with!– this stuff. We make this recipe quite often. I have found that it easiest to add the food color directly to the wet ingredients first, then I don’t have to knead the color in at all. I also have done this with the glitter and it works great. 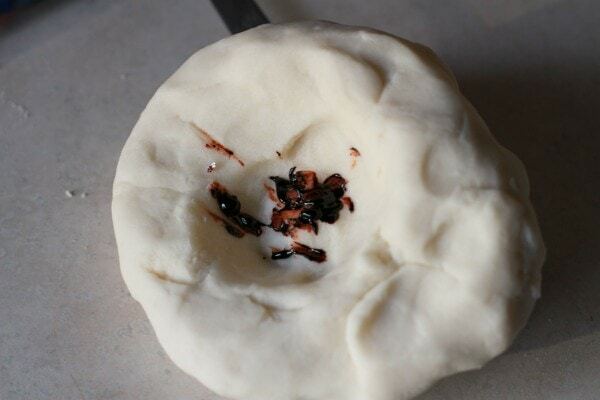 The kids might enjoy the process of seeing the dough turning from white to colored, but if you just need the process to be easier and quicker, add it first! Being as it’s confession time, I too have never made playdoh. I know – shocking! (I made salt dough for the first time before Christmas however). You’re ahead of the game on this one for sure! It is on the list however, as we just used up the last of the playdoh the kids had had as gifts for birthdays (I always ask for playdoh as a gift, as we get through a lot). It is a nightmare though – gets trodden everywhere. However not so hellish as Moonsand! The Kid’s get the Moonsand out, I get the Dyson out. Oh, my gracious. Moonsand is of the devil, I’m quite sure. We got some as a gift and I finally threw it out. I just couldn’t take it. It’s like Play-Doh mess on steroids. I’ve always imagined the inventor of Moonsand to sit in a large high-backed chair, stroking a long-haired white cat whilst laughing zealously in a sinister manner. They know the devastation they have caused. Try a pack of kool aid instead of food coloring–adds color and fruity scent. That would be fun! I think I have some packets in my cupboard somewhere. When I taught pre-school, we made our own play-dough almost every week. The kids thought it was great fun to knead and play with it. Also, adding some peppermint or almond extract gives it a great smell. Your timing is perfect! Glitter playdough was one of the things I wanted to include in my four-year-old’s birthday goodie bags, and kept thinking “I need to look up a playdough recipe.” Thank you! We’re putting it in #3 baby food jars (with the lids spray-painted). I’d missed the post on the pixie powder, but having done Pixos, Bendaroos, and heard tell of Crayola bubbles and Moon Sand, I can’t imagine what parent would EVER buy this stuff! I have been a preschool teacher for 20+ years so I have made hundreds of batches of playdough. When I want glittery playdough I give the children the little shaker bottles and they add their own. They make cookies and sprinkle on the “sugar”. They love this activity. Glitter will get all over the table of course but you just roll the balls of playdough around and the glitter gets magically sucked up! Cooked play dough is so much better than uncooked! I’ve had some in the fridge for months and it’s still fine. My recipe yields probably about half of what yours does, which I find is a good amount (but then I only have 2 kids). I usually add food colouring to the water before I cook it, which incorporates the colouring more easily and with less mess. But then you need to be happy with just one colour, of course! Or am I just not getting the connection? Oh! I accidentally linked to the search category instead of the specific post. It’s fixed now. I remember when my kids were little, I used baby oil instead of cooking oil. Loved the smell. I think I had as much fun as they did with the play dough. I love the glitter idea. Wonder if the grandkids would enjoy this next time they visit. I also never had play dough in my house because of the mess–until we received it as a gift. It wasn’t as bad as I thought it would be so we began making our own too. The glitter is a great idea! Does the glitter stay pretty well-stuck to the dough, or have you been finding it all over the house? Because Tess would LOVE this, but I’m not sure I want to be finding glitter in everything for the next six months, which seems to happen whenever I use glitter. The glitter does indeed stay stuck to the dough. It’s seriously the least messy way we’ve ever used glitter. I love homemade play dough. My mom called this “salt dough” when we were little. She’d dye it in vibrant colors. Whenever I have little kids around that need entertaining, I whip up a batch of peanut butter play dough. It provides hours of entertainment and a snack at the same time.